Goodbye Internet Explorer 8 and Hello Confluence 5.5! Atlassian has announced that it will drop support for Internet Explorer 8 after the next release of Confluence 5.5. My short advice to clients is to adopt Google Chrome – if you are stuck lagging on Windows XP it may be your only option. To allow us to dedicate resources to providing the best experience on modern browsers, Confluence 5.5 will be the last release that supports Internet Explorer 8 (IE 8). The reasons behind this decision are to enable us to provide the best user experience to our customers, accelerate our pace of innovation and give us the ability to utilise modern browser technologies. For a background on why, you may find this article useful: Old technology is wasting everyone’s time and money. That said, Blended Perspectives does have a significant number of clients that find it difficult to keep up on desktop deployments. IE 8 is holding onto its market share. 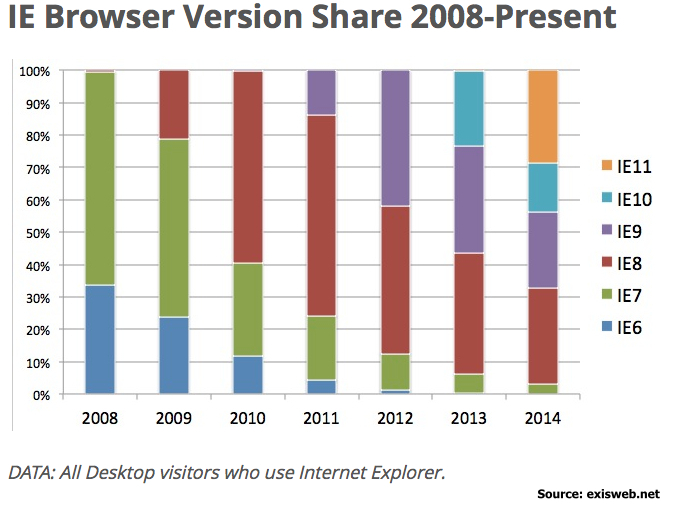 From Jan 1 2014 to present 29.8% of Internet Explorer users are still using IE8. IE8 as a proportion of IE users is not disappearing quickly. IE10 is already declining (in favour of IE 11). Organizations that don’t have the technology or manpower to upgrade regularly may need to hold back on Confluence installations. Software upgrades can be hard on organizations. Atlassian dropping support for IE 8 is understandable. This is because IE has disregarded web standards therefore requiring extra work to function the same as other browsers. However, IE is unquestionably important and this will alienate some customers. Customers otherwise have a choice to run an old version to keep up compatibility. Sooner or later that means keeping up with patches, which puts a strain on IT. Commonly affected include: Government clients, Non-profits and Corporates – all who in our view lag with slower upgrade cycles. This will also apply to Atlassian’s OnDemand, because Atlassian only run the latest version. If you want to remain on OnDemand you will have no choice but to upgrade your browser. To an extent this affects our hosting customers. Although our clients can still come to us for assistance with patches, the old version of Confluence will still be active. This has a knock on effect on marketplace vendor sales too. For an increasing number, dropping IE altogether in favour of Chrome is proving the way to go. The full version of the article can be found here: https://confluence.atlassian.com/display/DOC/End+of+Support+Announcements+for+Confluence. If you want to run an older version of Confluence, get in touch. We can host it for you, contact us here. Blended Perspectives is Canada’s largest Atlassian Solution Partner providing Consulting, Managed Hosting, Installation, Data Migration, Performance Tuning and Certified Atlassian training. We have deep expertise in all Atlassian products with certified experts covering the full lifecycle for SDLC, Service Desk and broader business application support. Founded in 2007 after years of experience serving clients in Canada, Europe, USA and Australia; Blended Perspectives’ mission is to enable Corporations to unleash the power of their teams and to leverage the true potential of their business via enhanced tools and processes.